On the occasion of Pongal, the harvest festival of Tamil Nadu, we bring you some traditional, easy to make recipes you can treat your loved ones to. The harvest festival of Tamil Nadu, Pongal, is celebrated as a thanksgiving to nature for a bountiful harvest and prosperity. This is a season when rice, sugarcane, turmeric and various other cereals are harvested. Local markets are also flooded with different varieties of fresh colourful vegetables, many of which are available only during this season. The traditional Pongal menu that includes both the sweet and salt pongal, sambar, avial, other veggies, masala vada, and not to forget the crisp appalam served piping hot on a banana leaf -- definitely a temptation few can resist. Dry roast the moong dal for one to two minutes, till fragrant. Wash the rice and pressure cook along with the dal for about four to five whistles. Saute till the cashew is golden and pour over the pongal. The only difference between cooking brown rice and white rice is the rice to water ratio. Because of the outer bran coating, more water and a slightly longer cooking time (approximately five minutes extra) is needed to cook brown rice. Alternately you can cook the rice in a pot with lots of water and drain the excess water after the rice is cooked. Pressure cook the dal with the tomatoes, shallots, green chillies, garlic and turmeric powder in four cups of water for three to four whistles (seven to eight minutes). Meanwhile, soak the tamarind in water for 10 to 15 minutes, and extract the juice. Keep aside. Pour some oil in a pan; add the vegetables and saute for a few minutes. Now add a cup of water and cook the vegetables for six to seven minutes. Open the cooker, mash the dal well, and add the tamarind extract, the chopped raw mango, boiled vegetables and salt to taste. Keep it back on the flame and allow it to boil. Cook over low heat for four to five minutes. For seasoning, heat oil in a pan, add mustard seeds, when it splutters, add chopped shallots, dried red chillies, curry leaves, asafetida and sambar powder. Saute for a few minutes and pour over the dal. Garnish with lots of fresh coriander and your delicious sambar is ready. Liked this recipe? Click here for more recipes and food features! Healthy and delicious, the avial is one of the most popular dishes of Tamil Nadu and Kerala. 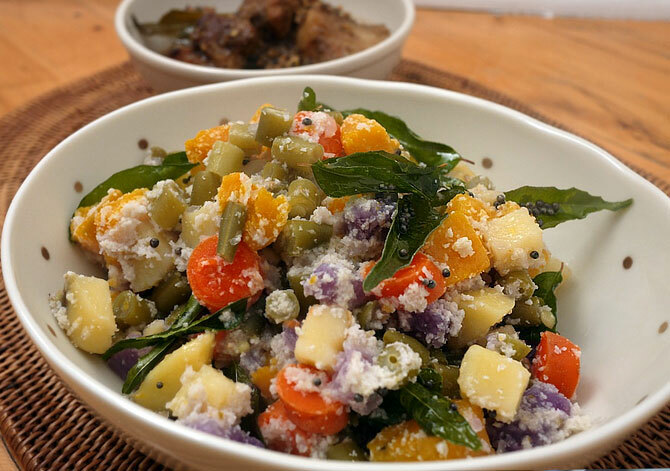 It is a mouthwatering combination of a variety of vegetables lightly flavoured with curd and seasoned with pure coconut oil, which imparts a unique flavour to this dish. Wash and cut all the vegetables lengthwise into two inch pieces. Boil in a large vessel until just tender with a pinch of turmeric, salt and little water. Do not overcook the vegetables. Grind the coconut, green chillies and cumin seeds without any water. Cook on medium heat till the gravy thickens. Lastly heat some coconut oil in a pan, add curry leaves and pour over the vegetables. Though Sakkarai Pongal is prepared on most festive occasions as naivedyam (offering to God), it tastes most special during Pongal. 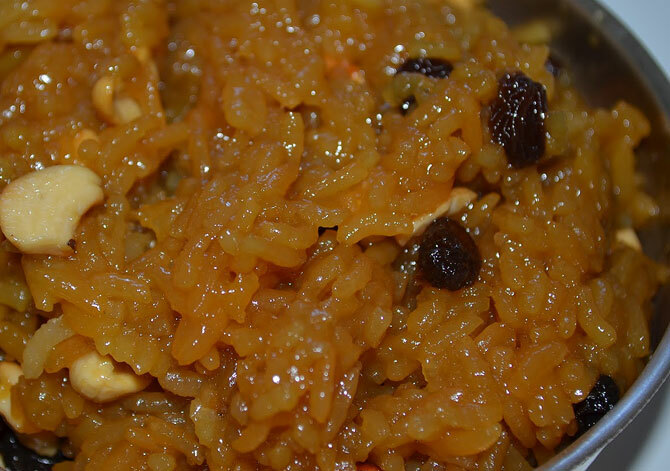 This soft, creamy sweetened dish prepared from freshly harvested rice cooked with milk, jaggery and ghee in the traditional earthen pot can truly tempt even the Gods. Wash and soak the raw rice for about 15 to 20 minutes. Take a large pot or heavy bottomed pan, pour in the milk and water and bring to a boil. Add rice and moong dal to the boiling water and cook till the rice turns mushy. This may take 30 to 40 minutes depending on the rice. Meanwhile, add 3/4th cup of water to the jaggery and keep on low flame, till the jaggery melts. Cool and strain to remove any dirt particles. When the mixture starts to thicken, take it off the flame. 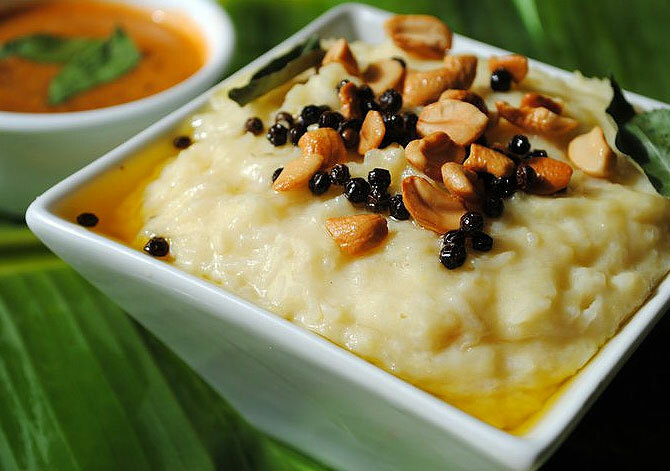 Heat the ghee, lightly sauté the cashew and raisins and pour over the hot sweet pongal. Winter recipes to keep you warm and cosy! Simple breakfast recipes to power up your day!